Crushed Lamps or Whole lamp Recycling? Balcan now have specific entry systems on their equipment to deal with crushed, straights, compacts and plastic sleeved lamps and the output in terms of all recovered materials is among the best that I have seen. Whilst Balcan Lamp Recycling Systems produce single systems to process most types of mercury lamps, they offer a number of variations of these lamp recycling systems. The upgraded MPC4000, now called the Balcan MP4000 now has dual loading areas for both linear as well as whole and crushed lamps. This Balcan MP4000 will happily get through 1000-1500 linear tubes per hour whilst processing other types of lamps and bulbs. The larger Balcan MP6000 unit again is dual loading. Having an extra section which acts as a reservoir, allows for greater volumes to be processed. The Balcan MP6000 will handle 2000-3000 linear tubes per hour along with other types of lamps. The MP6000 is also available with a conveyor feed for linear fluorescent tubes. The Balcan MP8000 is the system of choice in the USA and used by Balcan themselves. It comes as standard with a conveyor loading system for fluorescent tubes and also incorporates the Multipurpose / Universal lamp processing system, which is standard across the Balcan Lamp Recycling Systems range. The Balcan MP8000 has a capacity of 5000 linear tubes per hour as well as other types. The Balcan MP12000 is the lamp recycler for 10,000 linear tubes per hour along with other types of lamps. Similar to the MP8000 it features two conveyor systems as well as the Universal section. A serious machine for serious volumes. All Balcan lamp and bulb recycling systems have the advantage that they can recycle all types of waste mercury bearing lamps. Unlike other systems the Balcan lamp recycling systems can process everything together, whereas other lamp recycling methods require mercury lamps & bulbs to be seperated into different types. Balcan has always believed that for any waste lamp recycling system to be both economically and environmentally efficient, lamps need to be pre-crushed before transportation. This is because vehicles can then carry nearly five times more lamps than if they remain whole (a particularly important factor when lamps need to be transported over long distances). Therefore, Balcan plants have been designed to be as versatile as possible and capable of accepting all kinds and sizes of both whole and pre-crushed lamps. Our crushers can be mounted on static locations or fitted in vehicles used to collect them. The design of our original model of Recycler (which we operated ourselves before replacing at the end of 2009) was based on this concept. The merit of this was duly recognised in the citation when we won the Queens Award for Enterprise in 2006. Recognising the increasing interest in environmental matters from countries with a lesser number and intensity of lamps, we have developed and produced the smaller, more affordable version of our recycling plant. This model is called the MP 4000. 1) The Electrical Control Cabinet from which the whole plant is operated. 2) The Dual Separator Unit, the first section of which initially breaks down the lamps fed into it with the second section completing the final separation of the components. 3) The Dust Removal Filter which draws off the dusty air down to 5-micron size. This also ensures that the whole plant operates under negative pressure so dust and vapour does not escape into the workplace. We use an Filter Unit, modified to fit over a 210-litre drum underneath for this purpose. 4) The Activated Carbon Stack which is used to remove exceptionally fine dust below 5-microns and mercury bearing vapour (that cannot be removed from the air in any other way) before release to the outside atmosphere. In use, lamps are loaded into the hydraulically operated loader mounted on the front first section of the Dual Separator. This is capable of accepting 210-litre sizes of drums of debris, whole lamps & bulbs, or debris fed directly into it in any other way. When handling linear fluorescent tubes, these are crushed directly into the system and will automatically be processed. When sufficiently filled, and the loader door closed, it is then raised to empty its contents into the drum of the separator. This in itself causes the debris to be further reduced in size and for the phosphor powder be drawn off by the filter unit. Before reaching the end of the Separator the glass cullet will have been removed from the debris and conveyed to the second section to remove all remaining dust. It is then discharged into a suitable container. All other debris is collected separately at the end of the first section (into a container provided by client). The resultant debris will depend upon the materials fed in at the beginning. 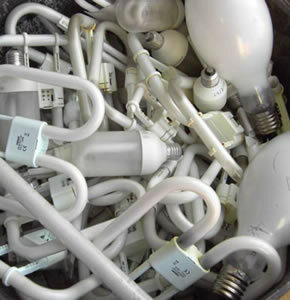 Feeding one type of lamp at a time, such as fluorescent tubes, will produce glass cullet and just one type of component, such as plain aluminium end caps. But feeding a mixture of lamp debris made up from modern lamps, such as energy saving lamps, which contain a high proportion of plastic components as well as metal pieces will produce a similar mixture of materials but free of glass! It is for the client to collect this in any desired way. When operated in the recommended way it is our experience it is possible to process the equivalent of 7-8 drums of lamp debris per hour. As we consider each drum can hold about 600 x 4ft fluorescent tubes, this equates to 38,400 lamps per 8-hour shift! If handling linear tubes these can be loaded at a rate of 1500-2000 lamps per hour. What about the recycled metal & plastic being mixed together? It is upto each individual company as to whether they can accept this. At the balcan lamp Recyling facility we can process everything together as the outlet accpets the plastic & metal mix without any problem. If your outlet for these products requires that they are seperated then it will mean you have to process metal ended and plastic ended lamps seperately.